A well-known polling organization recently conducted a survey of attitudes about sugar in cities across America. One of the biggest surprises was the wide range of guesses people made about how many calories are in a teaspoon of sugar. Most respondents thought it was 50 or 60 calories; one respondent said 1000! Nature’s very own sweetener has only 15 calories in a teaspoon – as well as all that natural taste and goodness, too! There are a myriad of reasons as to why sugar is included in food. The most obvious reason is tied to enjoyment. Sugar can add sweetness and improve palatability of many food stuffs. However, it also plays a key role in shaping food color (creates nice golden brown color in many baked goods) and texture (adds crispness to low moisture content foods). Furthermore it is a key component for food preservation (think jams and jellies), leavening (helping the yeast make bread rise) and viscosity. Sugar is also added to products to change the freezing point as a natural antifreeze. Sugar is more than a “fun” food ingredient, it’s an essential one as well. Because it’s all-natural, you can consume it with confidence. As Nature’s preferred sweetener, sugar is present not only in nutrient-dense fruits and vegetables, but is also a key component in foods as diverse as whole grain breads and cereals, yogurts and tomato sauces. With only 15 calories per teaspoon, sugar is no more fattening than any other 15 calories. Like all carbohydrates, the body converts sugar into fuel quickly. Fats, on the other hand, are stored in fat cells to be used later. The keys to a healthy lifestyle are as much common sense as they are scientific. You should strive to maintain a diet that includes a wide variety of foods that contain a range of carbohydrates, proteins, vitamins, minerals and fats. It’s easy to pick a single ingredient to label as “bad”, but the story is much more complicated. There is no correlation between body mass index (BMI, fat content in the body) and sugar consumption. Increased BMI is instead correlated with total caloric consumption. 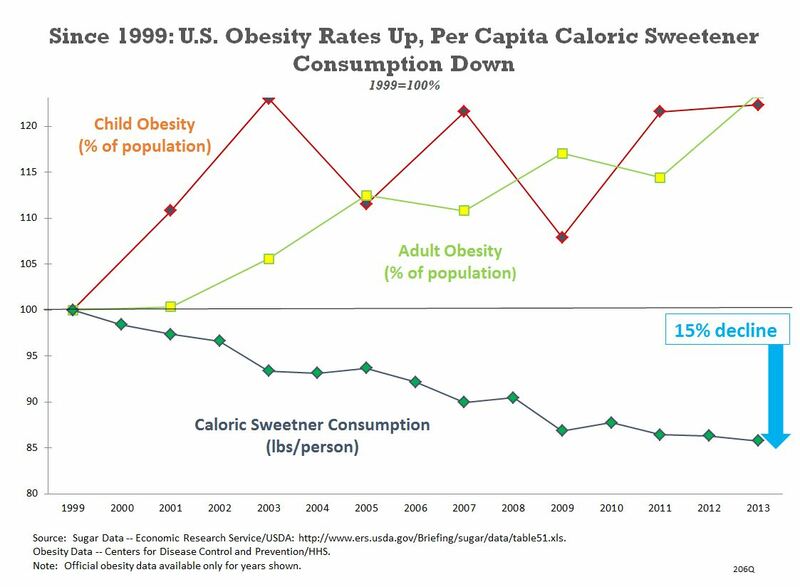 Furthermore, as the overall obesity rates for both adults and children have steadily risen since 1999, sugar consumption has been on the decline. Therefore optimal health is based on both what and how much someone eats. When it comes to consuming food, think moderation and choose reasonable portion sizes. To improve long-term health, an active lifestyle is as essential as sensible eating. Activities that increase heart rate, like climbing stairs in lieu of escalators, have been proven to be essential to help consumers maintain weight, build and preserve strong bones, control blood pressure and reduce risk factors for heart disease, Type 2 diabetes and some cancers. Being physically active also promotes psychological well-being. Nutrition experts consistently recommend increasing carbohydrates to achieve a healthful diet. Food rich in starches and fiber are usually low in fat while providing a good source of vitamins and minerals. 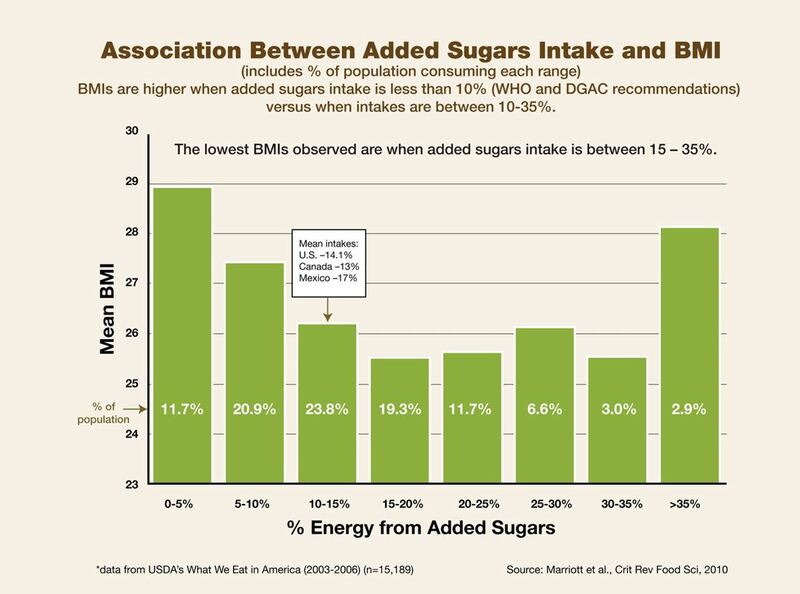 Since sugars are not uniquely fattening, replacing sugar with other caloric or artificial sweeteners is not a workable solution to weight management. Weight loss occurs by reducing the total amount of calories consumed or increasing caloric expenditure through regular physical activity. Common sense says that a combination of reduced calorie intake and increased calorie burning will be more successful than either single strategy. Although many claims have been made linking sugar consumption to a variety of diseases, a comprehensive review of the literature shows most studies conclude weak, moderate, inconsistent or no correlation at all between consumption of sugar and increased weight or diabetes (see below).